As the American public grows less and less tolerant of the egregious conditions animals are subjected to inside factory farms, the USDA has announced a new trade agreement that will likely cause tremendous suffering for even more animals. The USDA says it will be shipping live cattle to Mexico for slaughter, effective immediately. Secretary of Agriculture Tom Vilsack said in a statement that Mexico has the potential to import $15 million of live U.S. cattle per year and "help drive U.S. economic growth through trade by supporting and creating American jobs on and off the farm." While domestic factory farming has plenty of problems, exporting live animals introduces even more brutal conditions and practices. "During live export, animals are forced to endure extreme fear, stress and injuries due to overcrowding as they are trucked or shipped thousands of miles in all weather extremes, often without any food, water or rest," Matt Rice, director of investigations with Mercy for Animals, told The Dodo. Rice strongly condemns the new trade agreement. "With the steady decline in U.S. meat consumption over the last several years, the factory farming industry is desperate to peddle its cruel and wasteful products in other countries," he said. "The USDA's newest deal to ship live animals to Mexico for slaughter will have a devastating impact on human health, the environment and animal welfare." Besides Mexico, the U.S. exports livestock to Canada, Russia, Turkey and Egypt - the latter three nations, by sea. The cattle exported to Mexico will likely be transported by truck, says Lyndsay Cole, assistant director of public affairs at USDA/Animal and Plant Health Inspection Service (APHIS). Cole told The Dodo that under interstate law, the cattle must be given rest "feed and water" every 28 hours - meaning the animals can go more than a day without either. There is no age requirement for the cattle, nor is there a law that says a veterinarian must accompany the animals on the journey. However, the cattle must be inspected by a USDA-accredited veterinarian within 30 days prior to shipment, and again at the border crossing by a Mexican government veterinarian, says Cole. As for regulations that apply to the the welfare of cattle being shipped via the high seas, oversight is very, very dim - at best. The 28-hour rule goes out the window once a vessel enters international waters, says Joelle Hayden, public affairs specialist at APHIS. Hayden said she was unable to answer questions about how long each overseas journey takes, because shipments in international waters aren't in the USDA's jurisdiction: "USDA regulations require animals are provided with food, water and sufficient space during their journey. That is the extent of our authority," she notes. There's no official count, or even estimate, of how many cattle die per year or per shipment, explains Hayden. However, she does note that the USDA recently proposed a rule that would require owners of ocean vessels to submit a report within five business days of completing a voyage as an effort to document livestock deaths, including "any failures of life support systems," like air conditioning, she added. The World Animal Protection campaigns against live export and especially condemns transport by sea: "The trauma that ... cattle endure during their voyage overseas makes live animal export truly unacceptable ... The conditions on board ship are so harsh that the animals suffer severe distress, illness and injury, and many die before they reach port." While the export of live farm animals doesn't receive exceptional scrutiny in the U.S, it's hotly debated in other countries, especially Australia, the leading global exporter of live cattle. In 2011, undercover video documenting barbarous torture of Australian-shipped cattle inside Indonesian slaughterhouses sparked national outrage. Animal advocates pointed out that it isn't just the potentially fatal journey on the high seas that is concerning, but what happens to the animals once they get to international shores. 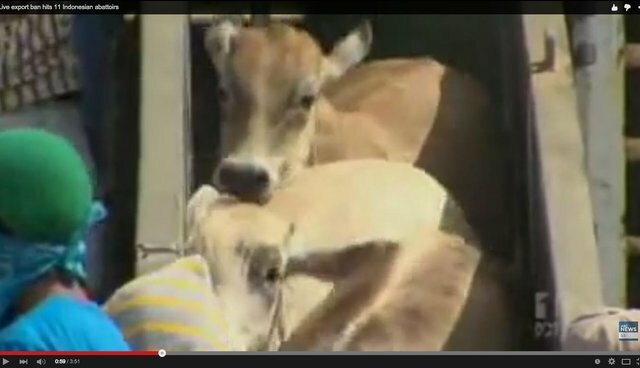 Animals Australia, a welfare organization, captured the footage inside a number of Indonesian abattoirs once the cattle arrived. According to those who analyzed the the footage, the animals were whipped, bloodied and even conscious when they were dismembered. (You can watch the award-winning series, "A Bloody Business," by the Australian Broadcasting Corporation here). Another undercover video by Animals Australia documented the killing of 22,000 sheep, exported live from Australia to Pakistan, describing the event as the "worst tragedy ever documented in the bleak history of Australia's live export trade." Footage shows absolute chaos, "with animals being dragged, beaten, having their throats sawn at with blunt knives and thrown into mass graves - some of them still alive hours later." For now, there is a temporary ban on the export of Australian live cattle to Indonesia. When asked if the USDA plans to increase its export of cattle internationally, Cole told The Dodo that it was dependent upon the demand of the importing country.